Off the tourist-beaten path in 1000 acres of a private nature reserve stands the quiet retreat of Singletree Gun and Plough. 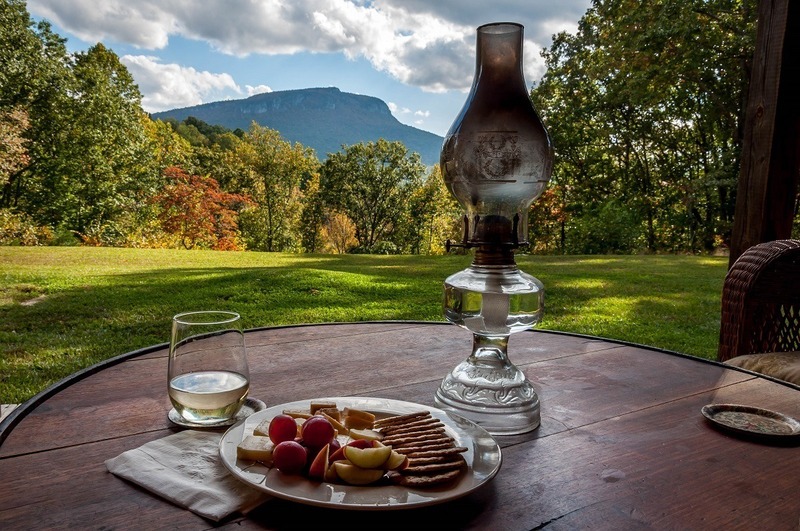 With over five miles of riverfront access, endless hiking opportunities, and mountain vistas for days, the setting of the Singletree lodge and cabins is a place to completely lose yourself in the beauty of North Carolina while not-quite-roughing-it. 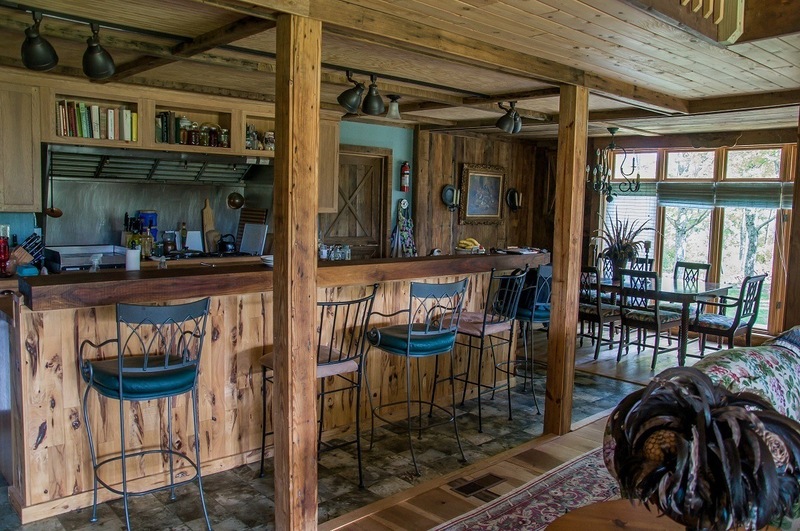 At Singletree, guests have the dual experience of staying at a country hideaway down a gravel road while still having all their needs catered to by owner Johannah Stern and her partner Willy Sparks. So much more than a bed and breakfast, Singletree Gun and Plough does everything possible to give its guests an “elegantly rustic” experience. Want to be met with a catered lunch on the riverbank during your kayak ride? They can take care of that for you. Looking for a customized hunting or fly-fishing trip? You’re covered there, too. Or if you’d rather just end the day with wine and cheese on the porch, that can also be arranged. 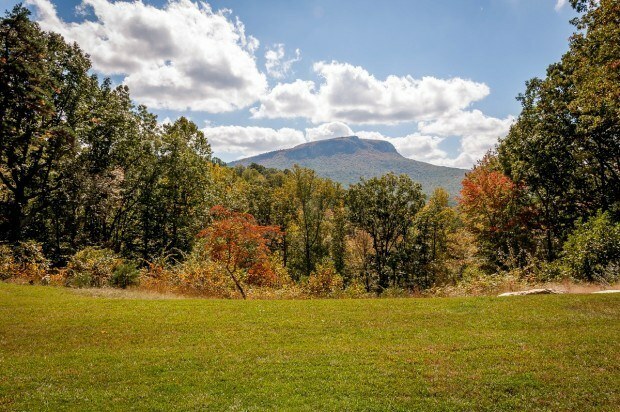 In addition to the activities on the Singletree property, guests have easy access to Hanging Rock State Park just five minutes away. Visitors can boat, swim, rock climb, and hike to their hearts’ content. 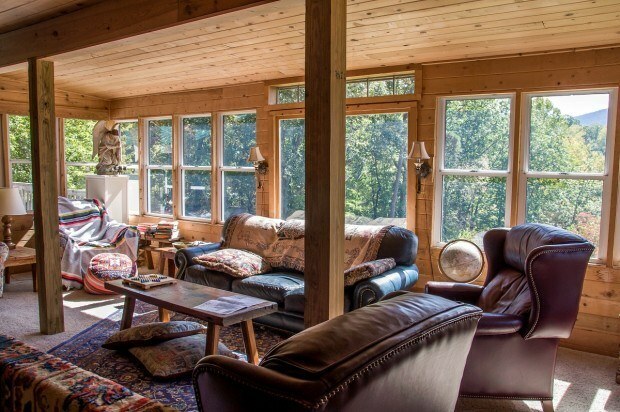 With the comfort of Singletree’s six-bedroom lodge and three cabins to return to, you might as well wear yourself out during the day. 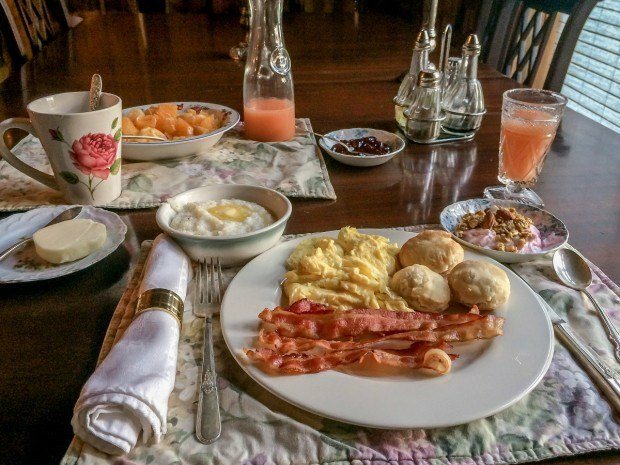 Food: Since Singletree Gun and Plough is a bed and breakfast, meals are served around the dining room table. But other than the homey atmosphere, you would almost think you were at a restaurant. The food is that good. And plentiful. Breakfast included bacon, eggs, grits (because, the South), fruit, yogurt, and some of the best homemade biscuits I’ve ever had. I was actually disappointed that I couldn’t finish it all. Dinner, which is available for an extra cost, was also a hearty complement to the rustic surroundings – perfectly tender beef with potatoes au gratin, vegetables, and pairings with North Carolina wine. All meals are made with local, organic ingredients. The cabins on the property are self-catering. Common Areas: The first floor common areas are a dream for anyone wanting to relax into the numerous couches and overstuffed chairs. 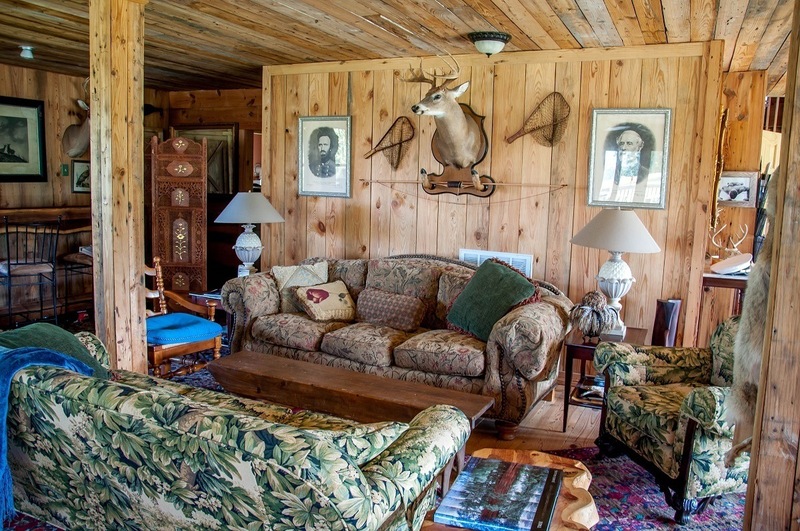 Guests can lounge in front of the TV and fireplace or play billiards or chess. Upstairs, there is room to spread out and read or play games in the library loft. 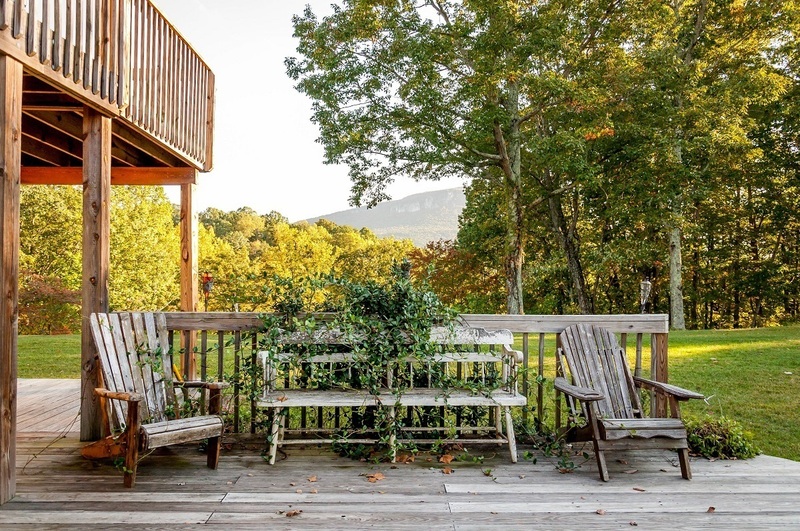 There is also lots of seating on the side and back porches to enjoy the views. Activities: Singletree offers fly-fishing, canoeing, zip lining, rock climbing, and mountain biking packages. There is no shortage of things to keep you busy. The Room: My room (aka Allie’s room) was a comfortable corner of the second floor. It was furnished with a queen size bed, end tables, lamps, and a dresser. Its greatest assets are the views – Virginia is in the distance to the North, and the Appalachians are to the West. Other rooms in the lodge are outfitted with similarly rustic decorations, and the number and sizes of the beds varies by room. 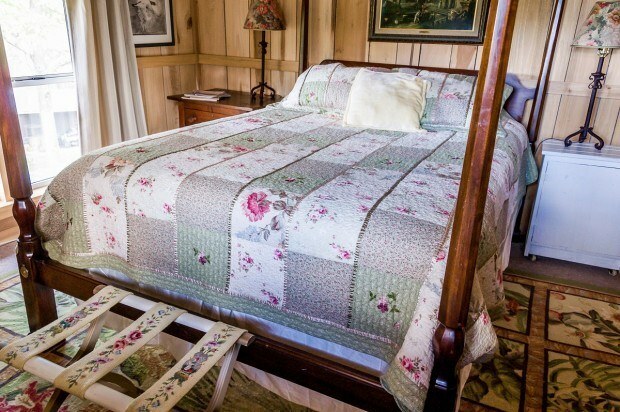 The Bed: The bed had plenty of pillows, a soft mattress, and a quilt like my grandmother would have made. Bliss. The WiFi: There is WiFi available in the lodge – a rarity in this area – but the strength varies based on where you are in the house. This is not a place to come if you’re planning to be regularly connected. 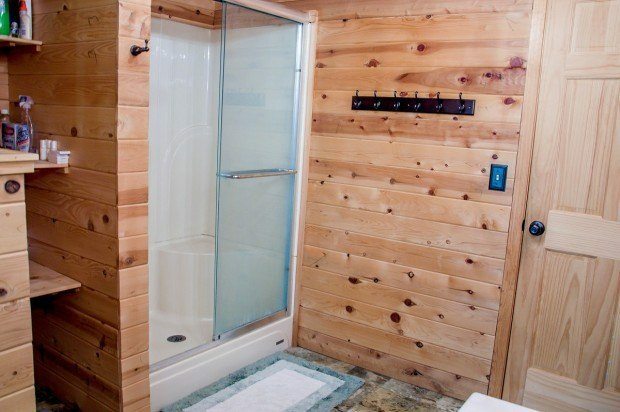 The Bathroom: Two bathrooms – one on the first floor and one on the second floor – are shared by the lodge guests. Each bathroom has a toilet, sink, and shower. The Bathroom amenities: Each guest receives their own bathroom amenities, including shampoo and locally-made soap. The cost: Including breakfast, room rates vary from $180-300 per night. 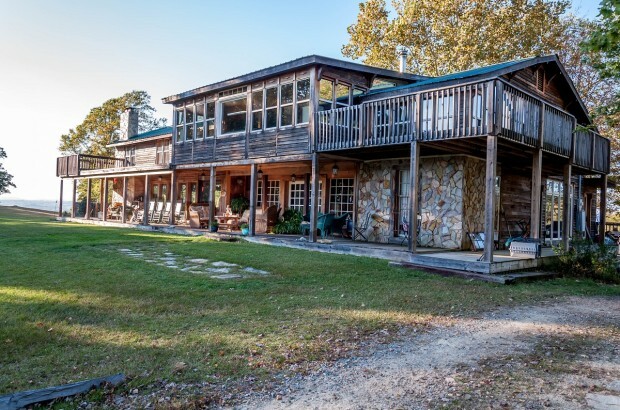 The location: The address of Singletree Gun and Plough says it is located in Westfield, North Carolina, though it is actually much closer to Danbury. 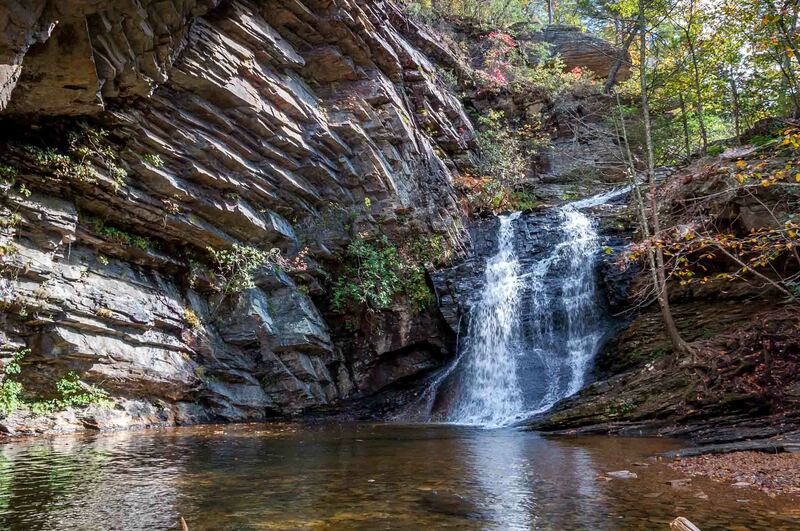 The property is just minutes from Hanging Rock State Park. It is approximately 30 miles from Winston-Salem and 50 miles from Greensboro. 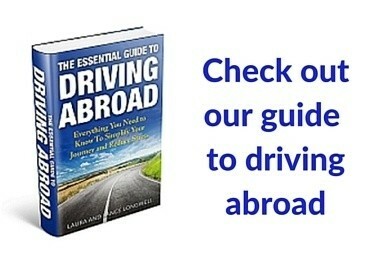 The roads leading to the property are not paved, and four-wheel drive is recommended. Surrounded by nature and near a beautiful state park, Singletree Gun and Plough is the perfect destination if you’re looking for a rustic getaway while still receiving top-notch service. The food is great, there’s lots to do, and the views are spectacular. What more could you ask for? We were the guests of Visit North Carolina and Singletree Gun and Plough. All opinions of the comfortable and delicious are our own.